Oh, no biggie... he turned one a few months ago! Every parent says it with every child, but wow! How does time go by so quickly? This boy is wild. Can you see that look of curiosity in his eyes and those teeth flashing through his smirk and that crazy hair that will never be tamed due to constant run-ins with the carpet. I'll tell you what, he keeps us all on his toes with his infectious laugh and constant, intentional humor. It never occurred to me that someone so tiny could be such a comedian! - Wears size 4 diapers (bumped down a size due to excessive walking). - Wears 12-18 months clothes, although the pants are always too long. - Always smiles with his teeth showing. - Loves to wrestle and tackle anyone that's down at his level. - Is relentless at taking toys from his big sister. - Loves anything that has buttons or anything he shouldn't touch - garbage cans, cleaners, tools. - Enjoys playing with brooms and mops. They keep him entertained for hours. - Enjoys digging in the dirt (specifically shoveling dirt into a bucket). Also keeps him entertained for hours. - Can throw a mean tantrum... we're talking throwing himself on the floor and screaming. - Likes to eat, but doesn't eat meat hardly ever. - Is very on-and-off with different foods. He likes tomatoes, but won't always eat them. - Favorite foods include oranges, watermelon, strawberries, popcorn, grapes and crackers. - Hates being buckled into his car seat, but is fine once everything is locked in. - Loves to push things around the house - strollers, shopping carts, toy poppers, vacuums. - Is still very stingy about taking naps, but sleeps great at night. - Has 6 teeth, with a few molars cutting in. - Enjoys bath time, but sometimes cries about it. - Loves to dance and clap to music. - Favorite sport is Basketball. He will always choose a basketball if given a choice and will even watch it on TV with dad. - Also enjoys any sport with a racket (go figure!). Lately he's been carrying a badminton racket around since it's light enough to move around. 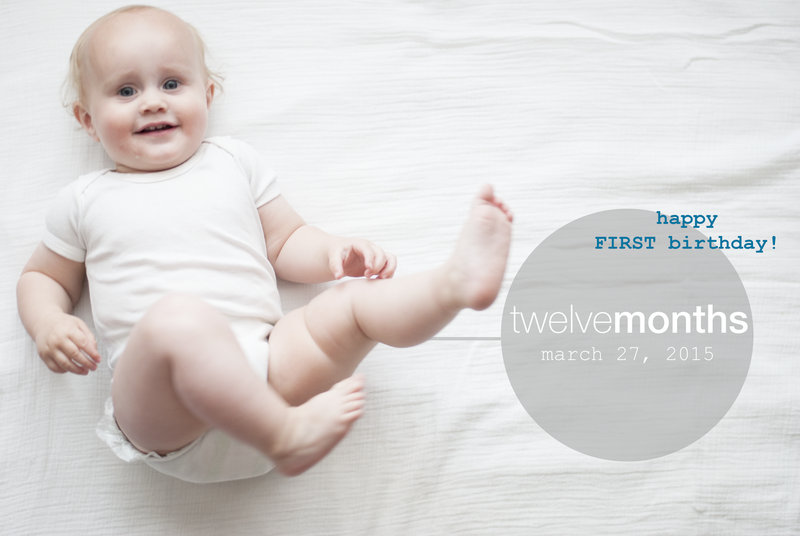 Happy 12 months to you, my boy!